Why cant I use just a "normal" vacuum? 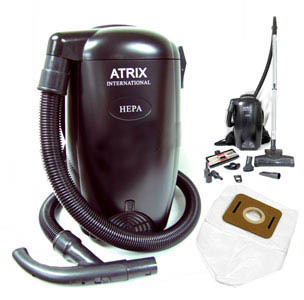 The Atrix Bug Sucker Vacuum has special attachments to allow vacuuming small areas, and it is very powerful. Other than that, if you can find a vacuum that is a backpack style vacuum with a really long cord, buy it. I haven't found anything like it. As far as tank size goes, this is the only tank size, although the actual filter size is 8 quarts. Fairly large. We only sell vacuums designed for insect and bug removal. You could use any vacuum for this, but these vacuums are designed to be portable and easily carried around. A large tank vac would be cumbersome to constantly haul around.